Our first month of school has flown by! 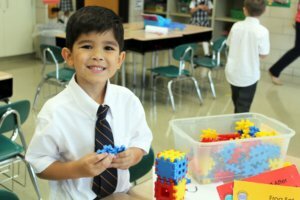 Progress reports are out, and our school year is well under way. 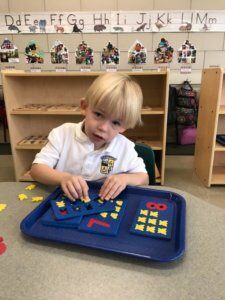 Our teachers have shared some of their favorite class moments and highlights with us from the past month. 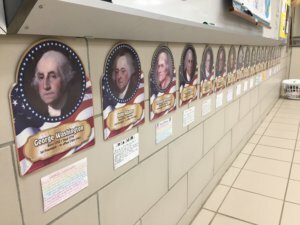 Mr. Haezebrouck’s seventh-grade history students compiled a list of “Fun Facts” about U.S. Presidents. The students enjoyed learning which president served the shortest term, which wrote a recipe for vanilla ice cream, and which had a pet alligator living in the White House. 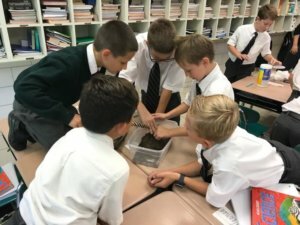 The fourth-grade boys class recently made casts of some mysterious footprints that showed up in Mr. Mitchell’s classroom. 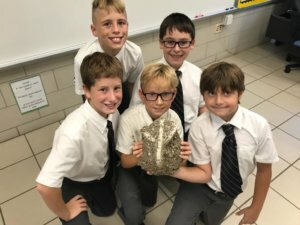 Animals such as the “Godzilla Chicken,” “Bearwolf,” and the “scrapdragon” were kind enough to leave footprints so the class could learn about how fossils are made and the casting process. 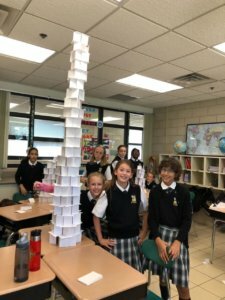 All elementary art classes are working together on a series of collaborative artworks that use recycled materials, inspired by Laudato Si, Pope Francis’ encyclical calling Catholics to be stewards of God’s creation. This is an in-progress shot of our current project, which uses stained, torn, or marked paper that would otherwise be thrown away, to form a paper quilt that explores color theory concepts and builds on the skill of craftsmanship. 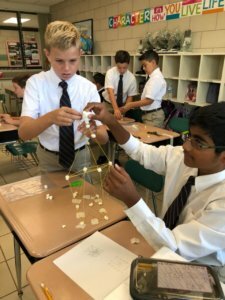 Middle school science teacher Mrs. Cook’s favorite class moment was watching her students bond over STEM activities. During the first month of school preschool has enjoyed rocking in their new school shoes, making new friends exploring the playground, listening to stories, and learning about transportation. 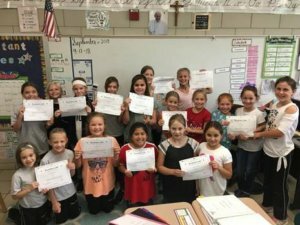 The third-grade girls’ class was challenged to memorize and recite the “I Can” poem which is all about having a positive attitude and believing in yourself. Mrs. DePorre was so impressed to see the girls’ team work, support, and encouragement for one another during this challenge. Although some took several tries, they all demonstrated great determination and perseverance through it all. She is extremely proud of each of them! A lot of learning is going on at Everest. We’re excited to see how our students will continue to grow and learn. → What’s Going On In High School?